Bill Wilson Center's Safe Place program serves youth ages 12-17 residing in Santa Clara County. Please contact Bill Wilson Center at (408) 243-0222 and ask for Deryk Clark, Safe Place Program Manager or email dclark@billwilsoncenter.org. Safe Place provides children in danger with a link to immediate help. 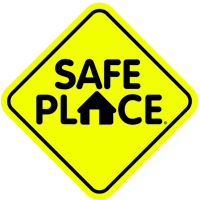 Safe Place sites, identified by a large yellow and black Safe Place sign, are available to any child who is in danger or feels unsafe, whether the threat is from a parent, stranger or peer. Trained staff and volunteers respond to calls for help 24 hours a day, providing children who are troubled or in danger with a safe haven. Safe Place locations include many schools, community centers, 7/11 Stores, Round Table Pizza, Safeway stores, Taco Bell, fire stations and all public buses and light rails. When a child requests help, a call is placed to Bill Wilson Center which sends trained staff and volunteers to respond promptly and provide appropriate help. Safe Place is a national program, for more information on the National Safe Place program, please visit: www.nationalsafeplace.org. National Safe Place has launched a nationwide project to help teens connect to a Safe Place location. The Txt 4 HELP project uses cell phone technology to quickly send teens information about the closest location where they can get immediate help and safety. Youth in crisis can text the word SAFE and their current location to the number 69866 and they will receive an address of the nearest Safe Place site and contact number for the local youth shelter. In cities that don't have a Safe Place program, the youth will receive the name and number of the youth shelter or, if there is no local shelter, a national-hotline number.